ICS is a stimulating and effective intellectual environment for research higher degree candidates and postdoctoral research fellows, running a program relevant to industry, government and community futures. This program has resulted in ICS's strong reputation as a successful environment for the development of professional researchers, through its practice-based intellectual culture, which fosters and encourages engagement with industry partners, external organisations and the broader community. ICS's large number of PhD candidates has created a vibrant postgraduate intellectual community. 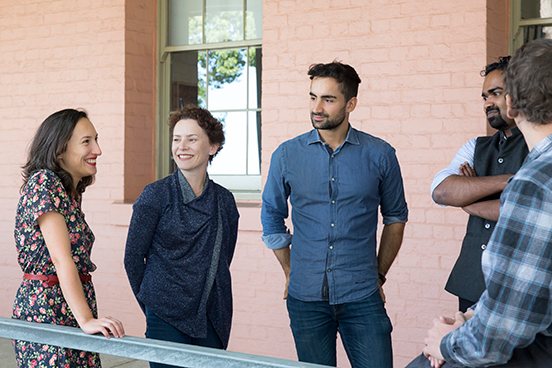 Prospective higher degree by research (HDR) candidates are invited to contact ICS HDR Director Professor Megan Watkins. Prospective candidates can enrol in a Master of Philosophy, Master of Research, PhD or a Doctor of Cultural Research (DCR). The latter is a doctoral research degree for professionals engaged with understanding culture in their workplace or career. This fee-based degree will suit people and employers who value rigorous academic research skills applied to current workplace needs. For further information on the DCR please contact Professor Megan Watkins. For more information about admission to Western Sydney University's research student program and scholarships, please see How to Apply for Research Degrees at Western Sydney University and Research Scholarships at Western Sydney University. The Institute holds seminars, masterclasses and other postgraduate events regularly. Many of these are organised by HDR candidates and most are open to people from other universities. Masterclasses are intensive study groups that usually run for 2-3 days and involve instruction from leading researchers in the field, often visitors from overseas. The ICS strongly advises postgraduate candidates to attend masterclasses throughout their candidature. The aim of the ICS HDR Key Thinkers and Concepts Lecture Series is to introduce HDR students to key theorists and concepts of central importance to sociocultural thought. With presentations from experts from within the Institute for Culture and Society and beyond, each session involves a one hour lecture followed by 30 minutes of questions and discussion. ICS students have a strong record of publication in peer-reviewed journals, edited collections, and conference proceedings. They are also encouraged to make presentations at national and international conferences. A list of student publications can be viewed on the HDR Publications page.